This was one of my favorite albums as a kid. I was probably one of the only kids that ever heard it! I love you!!! I have been desperately searching for this for months! Thank you so much! hehe, I had that one when I was a kid! OMFG. I have been trying to find this album for YEARS! LITERALLY YEARS! NOBODY BELIEVED ME THAT IT EVEN EXISTED!!! I bow to your greatness. YES! I loved this as a kid! I still love it! Everyone thought I was crazy! It DID exist! Too funny! My wife thought I was making it up as well! I recently found "Urban Chipmunk" (which I had as a kid) for $1 at a flea market. 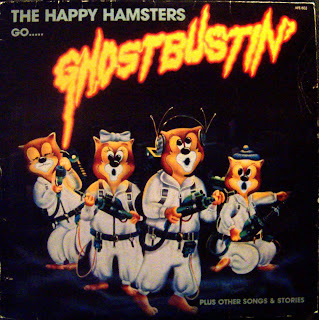 That inspired me to find the "Happy Hamster" records I had.I can't believe there were others who remember this as well! In the early 80s, I worked for Building 19, a Boston-based surplus and salvage chain. We used to have this! Oh wow. Happy Hamsters do have a small cult following. I never expected to see this on the internet. One thing is for certain, though. I still can't find the Christmas album, "Merry Christmas From The Happy Hamsters." If anyone knows where to find any trace of it, I'd like to know. I was like 4 or 5 years old when my mom bought the cassette. I still remember the tracks like it was yesterday. I love finding obscure records I can't play anymore because I don't have a working turntable! Thank you for the post!! Awesome! I actually still have this record. I cherish it greatly! was always one of my faves as a child too! I ripped mp3's from it in like 2006 so i would never have to touch it again if I so happened to want to hear it again. I played it on Halloween once and provided it to a Ghostbusters fan site for reviewing as well.